In other words: Write more shorter pages. Indeed, writing more shorter web pages has long been the rule of thumb for content length. But does this guideline still make sense? Should we write more shorter pages for clickers? Or fewer longer pages for scrollers? In other words, should you write index cards or toilet paper? Want more tips and techniques for avoiding overwhelming mobile readers? 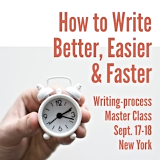 There, you’ll learn tips and tricks for writing readable emails, blog posts and web pages.